Atwood RV water heater is a well-known name for water heating in recreational and mobile vehicles. Atwood offers appliances that are reliable, lightweight for easy installation, simple to repair, fuel efficient and economical. Atwood water heaters are available in sizes of 6 and 10 gallons, and are further divided into gas-powered models that are using electronic, pilot and pilot re-light ignition and a combination of gas/electric/engine coolant heat exchanger models. An electric heater from Atwood uses 120 V from the electrical grid or generator and one 1400 Watt heating element (screw-in or bolt-on type) for water heating. Some models are also equipped with the heat exchangers that use the "already lost" heat from the engine coolant and such heating is combined with the electric and/or propane gas heating. A great benefit is that hot water is ready even before you arrive. An electronic ignition in propane gas models allows you to turn the water heater ON conveniently, by simply flipping the switch from inside the RV. In a case of the pilot re-light water heater, you will light the fire once so even if the wind extinguishes the flame it automatically relights itself. Atwood RV water heater with the pilot ignition requires standing pilot to be manually lit when the destination is reached, and once lit, it takes approximately half an hour before hot water is available. All gas-powered models must transfer the products of combustion out and get the fresh in from outside the RV. Models GCH6A-10E and GCH10A-4E are coming with the capacity of 6 and 10 gallons, and are designed for heating by combining all three options; propane gas, electricity and heat engine coolant. GC6AA-10E and GC10A-4E are models with the 6 and 10-gallon capacities, and they use propane gas and electricity for water heating. Models G6A-8E, GH6-8E and G6A-7 are all 6-gallon models that are powered by LP gas only, while the model GC6AA-8 is a combination of LP gas and electricity. G6A-7P is 6-gallon model that uses LP gas for water heating and is the only model with the re-light option. Models G10-3E and G10-2 are 10-gallon models that use LP, while GC10A-2 combines both gas and electricity. All Atwood hot water heaters are designed to provide efficient water heating and enough hot water for your comfortable shower or cleaning the dishes while camping or traveling. Atwood RV heaters are installed from the outside and accessible through the exterior door, which makes the repair convenient and fast. 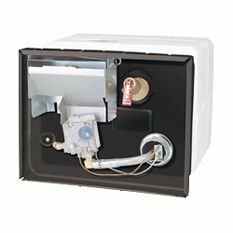 Atwood RV water heater is safe to use, as it is equipped with many protective features, such as the high-temperature limit switch, TPR valve, thermostat and sealed combustion chamber. See the reviews and prices of Atwood on Amazon.com. When comparing Atwood models with other manufacturers, such as Suburban; Atwood is lighter, as it uses the aluminum clad tank vs. steel tank on other heaters, and such cladding eliminates the need for the anode rod and stinky water problem. Before installing the water heater, it is recommended to test it on the RV floor, just to make sure that it works properly. The unit is mounted flush into the RV sidewall for an easy access from the outside, and with the matching access door, it will ensure the attractive exterior as the painted door nicely blends in the RV color. Atwood Company is located at 1120 N. Main St. Elkhart, IN 46514, US and if you need a customer or technical support call them on 800-546-8759.